Everest region is the most popular destination on earth for trekking, climbing and mountaineering. While climbing or trekking there might be some emergency cases due to Acute Mountain Sickness or by any accidents. In such emergency cases rescue by helicopter from Everest is the only one option to save the life of injured person. For any kind of emergency cases helicopter rescue is the best way to handle the situation. There have been many disasters during Everest Expedition; many climbers have lost their lives while some have been successfully rescued, too. 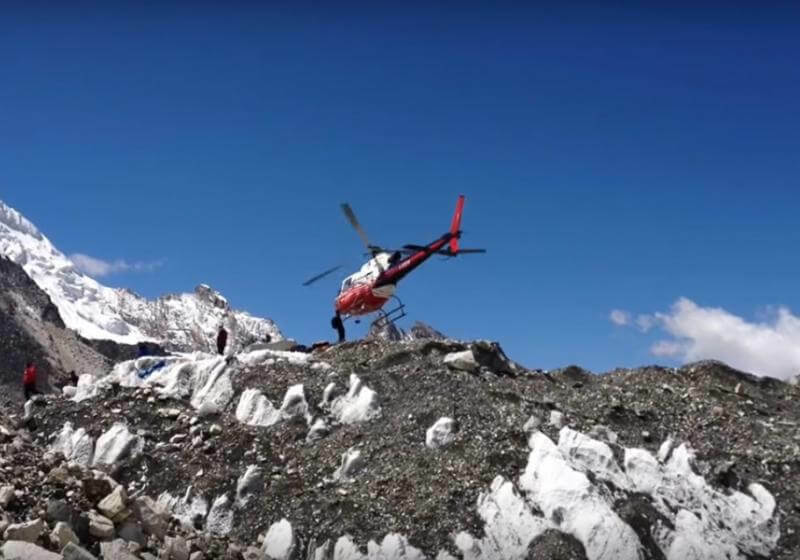 In the beginning period of Rescue (2008 and earlier) only Nepal Army used to rescue peoples from Everest but recently private Airline Companies have also started their rescue operation in Everest with good results. The helicopter can fly at an altitude more than the summit of Everest, but landing is the most difficult part. The rescue operation is limited to 2nd Base Camp at an altitude of 6,400m and only in Nepal’s side. China doesn’t allow flying helicopter on Everest. Sometimes rescue may take longer time because of poor visibility. We will try our best to rescue you from Everest Region. There are so many hospitals with helipad, where you will be transferred immediately if case is serious, otherwise you will be transferred to the best Hospital nearby.